The Rockville APM5 Active Studio Monitor Comes in Pairs and each monitor will be bi-amped. What this means is that there is a separate amp for the highs and a Separate amp for the lows! Each speaker has 125 watts peak output power and 62.5 watts RMS giving you a total of 250 watts peak and 125 watts RMS per pair. We spent a lot of time developing the most premium studio monitors we ever built! I am very pleased and excited to talk to you guys about what we did to make these speakers sound as good as they do. If you are an audiophile you will find what we did to be quite amazing. Keep in mind, the only reason our price point is not 300 % higher is because you are buying manufacturer direct. We are one of the leading speaker manufacturers in the USA, and we have a state of the art manufacturing process. There is a lot to talk about so I will break it down into sections. 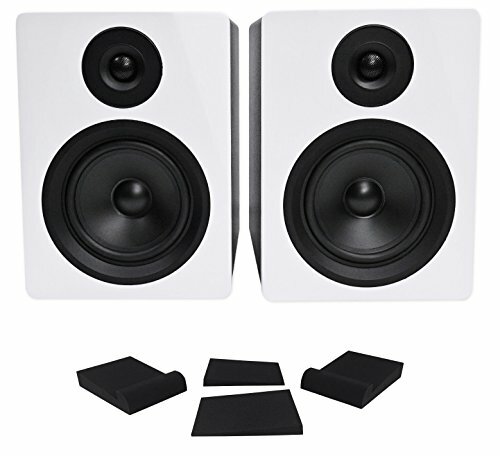 Rockville APM5W 5.25" 2-Way 250 Watt Powered USB Studio Monitor Speakers in White ( Pair). 125 Watt RMS. Two-Way Active Studio Monitor Speaker System. Quad Amp Design: Each Driver Features Frequency Specific Independent Amplifiers. Enclosure is made of top quality MDF wood. Our enclosure is not particle board, it is true high-grade MDF! The enclosure is 0.5" thick while the front board of it is a full 1" thickness to give you the ultimate best sound quality! Comes in 3 enclosure finish options Wood finish painted black. Wood finish painted white. Wood finish with vinyl front board. We use "baking paint" made for wood surface. It lasts long and is the best paint for speakers!. Beautiful finish is matte with a slight shine to it. Our designers spent a lot of time on the color to make it beautiful and elegant looking to improve the appearance of your studio or room. The enclosure is built with the perfect amount of air space to maximize sound quality for a studio. The port is built to the perfect spec to enhance the sound. Full Range Class "D" Amplifier Circuitry with Auto-Switching Power Supply. LED Power on Indicator on Rear Panel . Ferro Fluid Enhanced ¾" Neodymium Silk Dome Tweeter With Metal Grill Protection. Tweeter has ¾" voice coil diameter. Curved Front Bezel Design Eliminates Standing Wave Distortion. The Rockville RRS190S is specially designed to increase monitoring accuracy. These are made to decrease unwanted vibrations and noises so that you are left with accurate sounds. No matter how good your monitors are, they can never sound the way they were meant to if they are carrying over vibrations and unwanted noises into your music. These are 7.5" by 9.5" and includes 2 pads which will accommodate (2) monitors. Rockville RRS190S: Monitor Isolation Pads . 3 Angle High Density Foam. 7.5" x 9.5". High quality, High Density Foam. Eliminates vibrations and unwanted noises in your studio. Price is for (2) pads which accommodates (2) speakers.